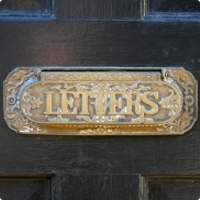 Blog › Need a Letterbox....tired of your traditional Letterplate? Earlier this year, an elderly woman encountered an arson attack through her front door letterplate! An arsonist attempted to force a lit newspaper through the womans letterplate in Southampton, which Hampshire police believe is linked to a series of arson attacks a few days later. The newspaper was set alight and efforts were made to try to post it through the letterplate, however fortunately the fire did not catch resulting in no damage to the property. A nearby fence, sale board, bin, and canopy attached to a car wheel were also set alight. It was believed that the suspect was not alone in this area and there were a team of vandals. Traditional letterplates have disadvantages such as noise pollution, theft, lock manipulation and are not considered thermo efficient with todays modern household energy ratings. Ever felt that draught through your hallway...? One of our anti arson letterboxes will fit neatly behind your existing front door letterplate, designed to protect your property from arson attacks. These fire resistant letterboxes include anti theft baffles too, preventing mail theft further. Our anti arson letterboxes are particularly popular around the firework season, catching fireworks, burning liquids and extinguishing the fire. Further still why not remove the possibility of a draught or hazardous objects entering your home and have a letterbox attached to your gate or wall outside. With so many modern and traditional designs available, you'll be spoilt for choice! Do you need a letterbox solution...? Please browse through our individual and multiple letterbox range today.